Brooklyn's Broken Circles is one of my current favorite record labels. They have a stable of interesting artists, many of whom you have seen reviewed here. To wrap up 2015, Broken Circles released a split record from bands that they have worked with over the course of the year. 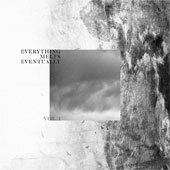 This is, supposedly (and optimistically) the first volume of their Everything Melts Eventually series, which they describe as split 7" records "that are tied together thematically under the umbrella of winter. They’re Christmas songs for the people who don’t like Christmas songs." Sounds fine to me, to be honest. I like the idea of new material tied to this time of year, instead of the umpteenth cover of Little Drummer Boy or whatever. The first band featured is Bandit, who i have never heard before. Their tune is Flake, a light pop tune with piano, a nice loping drum beat, and a female voice. It's a peasant little tune. Savannah’s Triathalon are up next with On The Sofa. It gets a typical Triathalon opening of slow drum kick and a guitar strummed under a mass of echo. The vocalist is hushed, singing up close and personal, like he is whispering to you. But it is the guitar part that makes this tune. It is a positively sublime echo that reverbs and warms. I also like the jazzy bass think that backs it up. Another fine tune from this trio. Moving up the coast to South Carolina, Ivadell give us Dog Days. This is a little more rocking than the previous songs. It's a crisp power pop song, the voice subtle and the guitars chiming brightly and slowly. Nice. Overall, this is a nice little single. I hope that Broken Circles can keep the series going.